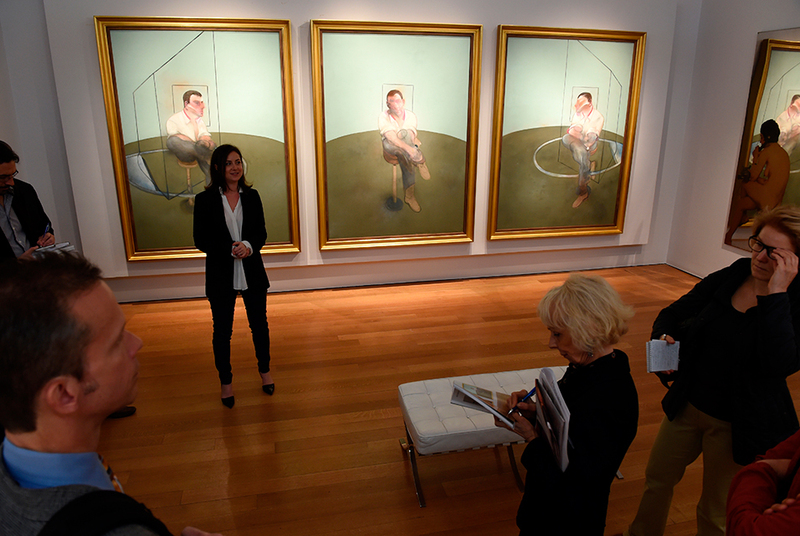 Sara Friedlander, Post-War and Contemporary Art expert, speaks in front of Francis Bacon’s “Three Studies for a Portrait of John Edwards”, painted in 1984, on display May 2, 2014 during a preview of the Impressionist and Modern Art sale at Christie’s that will take place May 6 in New York. The painting is estimated at USD $75 million. AFP PHOTO/Stan HONDA. NEW YORK (AFP).- Hype over Francis Bacon, whose work fetched a record price last year, is set to hit fever pitch when a new triptych goes under the hammer next week. Traditional auctions at Christie’s and Sotheby’s get into gear Tuesday and Thursday with modern and impressionist art expected to fetch a total of $1.9 billion, followed by ever more popular post-war contemporary the following week. With greater numbers of buyers interested in works from the post-1945 era, attention once again is turning to Bacon, who’s “Three Studies for a Portrait of John Edwards” (1984) will go on the block at Christie’s May 13 for an estimated $75 million. It is a portrait of Bacon’s close friend and confidant from the mid-1970s until the artist’s death in 1992. Edwards, who died in 2003, was the sole heir to Bacon’s paintings and properties. Another Bacon triptych — composed of three panels or pieces — “Three Studies of Lucian Freud” sold for $142.4 million in New York last year, smashing the world record for the most expensive piece of art ever auctioned. That outdid the previous high of $119.9 million for Edvard Munch’s iconic “The Scream” set in May 2012. The current Bacon-mania had yet another jaw-dropping day in February when his “Portrait of George Dyer Talking” sold for a dizzying $70 million in London. The triptych about to be on the block in New York was considered among his finest works, by Bacon himself. “This particular work portraits Bacon’s most celebrated subject and really closest and most significant relationship with John Edwards,” said Christie’s postwar and contemporary specialist Sara Friedlander.